Restore Health Pharmacy LLC (“RH”), TCS Labs, LLC (“TCS”) and Belvidere Labs, LLC (“Belvidere”), subsidiaries of Restore Holdings LLC (collectively, “Restore Health” or the Company”), are leading full-service wellness solution providers dedicated to the custom preparation of individualized, compounded medications. The Company possesses approximately 10,000 unique compounded pharmaceutical formulation recipes used to treat a wide variety of medical conditions and its pharmacists use state-of-the-art technology and innovative, quality-controlled compounding techniques to ensure that finished medications meet physicians’ exact specifications. The pharmacies excel in the formulation of drugs that are not commercially available as well as diagnostic laboratory and clinical services and training to a network of over 8,500 physicians and other healthcare providers across the country. In response to declining revenue due to increased regulatory oversight and pressure on insurance reimbursement for compounding pharmacies as well as integration issues from acquisitions, Restore Health subsequently closed the Madison, Wisconsin headquarters and pharmacy, while continuing to operate out of the St. Petersburg, Florida and Highland Park, New Jersey facilities. The Company filed for protection under Chapter 11 of the U.S. Bankruptcy Code for the Western District of Wisconsin. The Company retained SSG as its exclusive investment banker to conduct a sale of its assets. 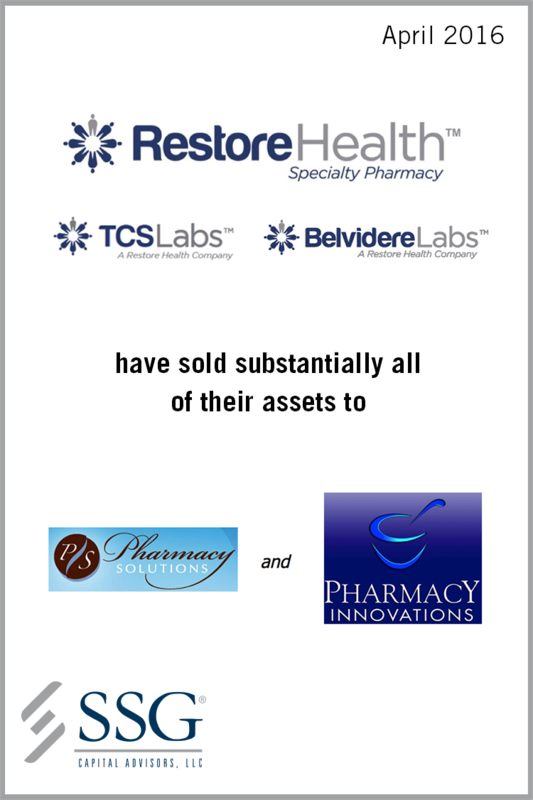 SSG conducted a comprehensive marketing process to a wide universe of strategic and financial buyers and determined that the sale of RH assets to Pharmacy Solutions and TCS and Belvidere pharmacies to Pharmacy Innovations would ultimately generate the highest value for the Company’s stakeholders. The transactions closed in April 2016.